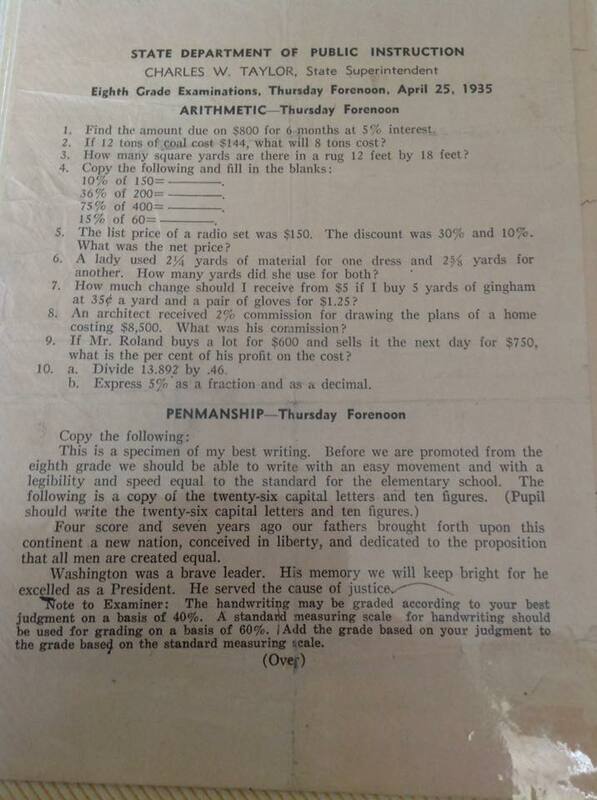 Here is the 1935 Eighth Grade Examination given in Nebraska. A few things of note for the arithmetic portion. 9 of the questions involve fractions, decimals, or percents. 6 of the questions involve percents. Percents have always been, and continue to be, very important in our world and in mathematics. 2 of the questions (20% of the 10 items) are on percent change. The one question that is not involving fractions, decimals, or percents involves finding area (and using units). 8 of the questions involve units (and are applied/real-world problems). The more things change the more they stay the same. Fractions, decimals, or percents are used pervasively in our society, are a challenge for students, and success with them is a good indicator of mathematical understanding.